Welcome to Plainfield, Indiana, a beautiful place to live, work, and visit, and a community our used car dealership is proud to represent! With so much to see and do in Plainfield, not to mention its beautiful scenery, you’ll see why these residents are happy to call this town home. Plainfield is known for its great combination of hills, forests, and prairies, along with White Lick Creek, providing residents with tons of outdoor activities to engage in. Additionally, The Shops at Perry Crossing will give the shopaholic in your family plenty of options on a Saturday afternoon. With so much to see and do in Plainfield, it’s no wonder residents need reliable vehicles to get from one place to the next. That’s where our team at Andy Mohr Toyota can help. Keep reading to find out more about us and our premier used car dealership by Plainfield, IN! At our used car dealership near Plainfield, our goal is to help you get into the vehicle that’s right for your lifestyle. Whether you’re looking for an SUV to fit the whole family or a sportier sedan, we’ve got your reliable pre-owned vehicle waiting on our lot. 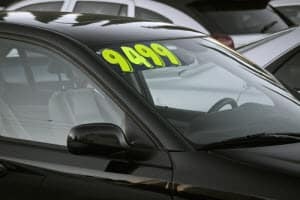 To get a better idea of the vehicles we have in stock, check out our entire used inventory online. You’ll find photos and details like fuel economy, mileage, technology features, and more, so you can choose your favorite and come in ready for a test drive. Once you choose the right vehicle, the next step is deciding how you’ll finance it. With our expert finance team, we’ll guide you to the right financing options, no matter what your financial background or budget. Having established relationships with banks and lenders in the area, you can rest assured you’ll be in the right hands when choosing a loan. Not to mention, we’ll be with you to explain any financial lingo or confusing terms before you sign any paperwork. Getting started is easy, too, with our online finance application. Just fill out some quick information, and we’ll have it processed and ready to go by the time you arrive! When you purchase a used vehicle with our dealership, we want to do what we can to help you make sure it’s on the road for years to come. That’s why we have an auto service center conveniently located right on site! With a staff of highly trained and experienced auto technicians, we can take on any maintenance issue that might pop up for you—big or small! From simple oil changes to larger part replacements, we’ve got you covered. You can even schedule service quickly and easily with our online service scheduler. Just fill out your contact and vehicle information, along with your preferred appointment date and time, and we’ll be in touch to confirm. If you like what you’re reading here, visit Plainfield’s preferred used car dealership at Andy Mohr Toyota today! We’ll be happy to set you up with a test drive in your favorite model, and tell you more about our simple and convenient car-buying process.